Real Food. Real Farmers. Bring the perfect mix of culinary inspiration, from organic vegetables to farm fresh eggs and cheeses to your table from the Village Pointe Farmers Market. Join us every Saturday (8:30 am to 12:30 pm) from May 5 - October 6, 2018, rain or shine. 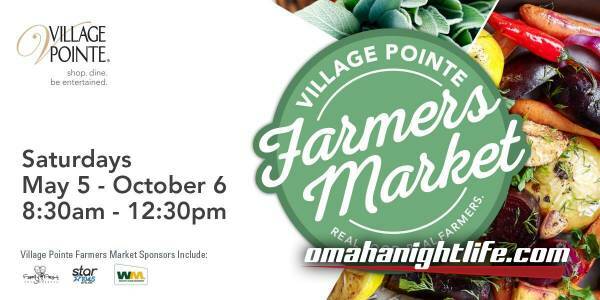 The Village Pointe Farmers Market is located in the southeast parking lot of Village Pointe Shopping Center on 168th & Dodge, Omaha. View all 30+ vendors: http://www.villagepointeshopping.com/village-pointe-farmers-market/ and make sure to stop by Cold Stone Creamery's booth for root beer floats, single scoop sugar cones, and create-your-own cookie sandwiches. Don't forget about your dog(s)! Cold Stone will also have dog bones from Rocky Mountain and "Dog Scoops". Enjoy free yoga classes hosted by Simplicity Wellness Yoga and More from 8:30 - 9:30 a.m. on the first Saturday of each month, beginning on May 5th.